Summary: Parents of the human children arrive at the school to take their kids away. But everyone is panicking and it turns into a riot. Meanwhile Adrienne sits and watches the chaos she caused. She informs Banshee and Emma that 'the bombs havent haven't evenstarted going off yet", which sends Sean in search of these bombs. Emma and Adrienne begin to fight. Banshee finds M and Synch. He sends M in search of the others in order to move the people out of the school and Synch accompanies him as he tries to find the bombs. Adrienne and Emma continue to fight, while Synch and Sean defuse the bombs. Sean gets separated from Ev and only realises it when he finds the other kids. M goes in search of Everett while Banshee, Chamber, Husk, Jubilee and Skin make their way out. Meanwhile Synch has found another bomb, but before he can get to it he's ambushed by some of the human kids. With only twelve seconds on the counter he synchs up with M, and gaining her superstrength throws the humans out of the room with the bomb before it explodes around him. The other GenXer's see the explosion and run to check on Ev. Emma stays behind with Adrienne, and decides to finish it once and for all. M and the others reach Ev, but it's too late and Monet cries over his body. Later, Emma and Sean talk to the kids. Their secret identities are secure, all the evidence has been destroyed and the human children and their parents remember nothing. 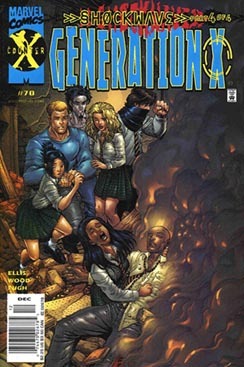 They have also decided that Generation X is going to change a great deal. They're no longer going to be cooped up in the Academy, but they can go out and make a difference in the world. Now the GenXer's are in control. Comments: Poor Ev. He'll definitely be missed.